Flower Pot Cupcakes ~ Learn, Live, and Explore! Do you ever remember, as a kid, going to a birthday party and having "dirt" for dessert. 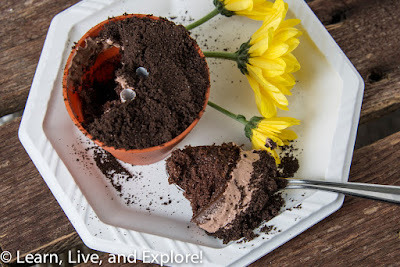 It could be a jar or container with anything sweet inside - cake, brownie, ice cream - so long as it had finely-ground chocolate cookies sprinkled on top, straws full of flowers stuck in it, and gummy worms crawling out the side. Well, fast forward to today, where making dirt for dessert got infinitely easier! 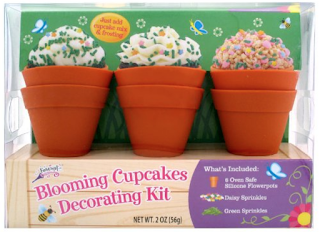 Enter the flower pot silicone baking cup! I found mine at Michaels, but google the term or click here to get yourself a set or another set like it on Amazon. 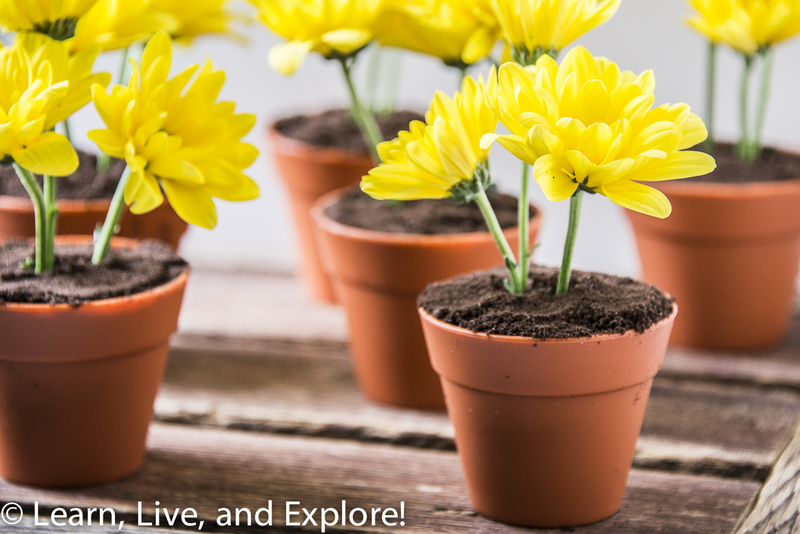 Using boxed chocolate cake mix, prepare the batter as directed, then fill the flower pots to the indicated fill line on the mold. Set the molds in a cupcake tray for ease of baking and transportation, then bake as directed and check for doneness using the clean toothpick method. 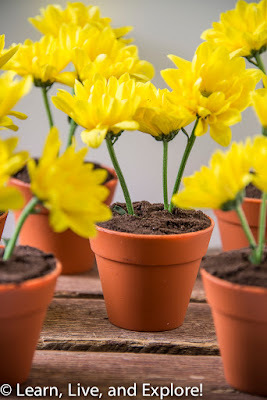 Cut the straws so that they are just below the rim of the cupcake flowerpot mold (you should get two good cut straws per original straw). Prepare two for each cupcake. 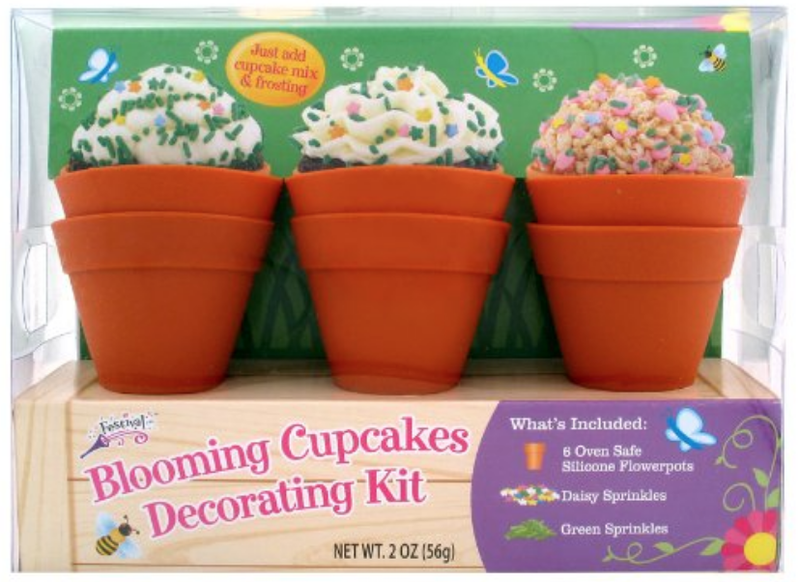 Using a spare straw, punch into the cupcake where you want a flower to be. Pull that straw out and replace the hole with a cut straw. Gently blow in the end of the spare straw (I did it into the sink)to empty out the cake that was just removed. Repeat the process for all straws. Either buy or prepare chocolate mousse while the cupcakes are baking and cooling. I opted to cut off the dome of the cupcake to make room for mousse and dirt (also, I saved the scraps for cake snacks later). The mousse is nice for getting the needed adherence for the "dirt." The absolute best way to add the mouse is to use a piping bag (no tip needed) or even a ziploc bag, sealed with the corner snipped off. Place cookies in a blender or food processor, and blend the cookies into a fine powder. Gently sprinkle the cookie dust until mouse is completely covered. Cut the flowers down so that the stem is 4-5 inches and select the thinner stems to fill the straw. Keep finished product in the refrigerator and serve soon thereafter.